Background – If you read this column regularly, you know that I’ve been reading a lot of poetry lately. I’ve actually made it a professional goal to explore poetry in my classroom with more intent the last couple of years. This means that my Twitter feed is almost saturated with poetry, a stream of sharing from poets and poetry journals. An especially rich feed lately has been that of poet Kaveh Akbar, who regularly posts images or links of poems that move him. In December, he tweeted a handful of poems from what was then the new issue of Poetry. I did what I do on Twitter, and slapped my personal curation hashtag on them, and made a mental note to peruse that list later. I happened to be at a bookstore that carried Poetry, and bought it, recalling that Kaveh had tweeted some good pieces from it. Then, I started reading, and flagging poems. One of those poems I’ve already played with in my classroom, and I’d like to share today. 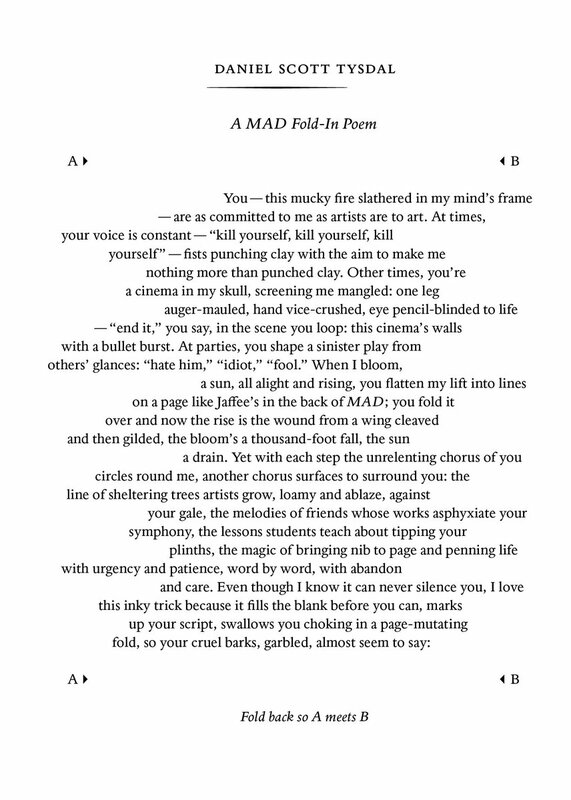 My geeky little heart pounded a bit faster when I came across Daniel Scott Tysdal’s poem “A MAD Fold-In Poem.” I remember the MAD Magazine fold-in so fondly. For those who’ve never seen one, the inside rear cover of MAD Magazine often featured this piece, where an image and phrase would form a different, related image and phrase when the page was folded, touching the A and B arrows together. I loved the art, and I loved the bit of satire that this often carried. Sometimes, it read like the punchline of a joke, but more often, the folding revealed some sort of hidden side to the issue being featured in the larger image. Tysdal’s poem uses this conceit. As you read it, before any folding, you’ve got a poem. The poem ends with a colon, as if more poem is promised. When you follow the instructions, and fold the page, connecting A to B, another line appears, finishing the poem. What a fun little device to explore. I knew that in January, we’d be exploring social justice issues in two of my courses, creating multigenre projects and zines. This poem was a perfect fit for those. Poetic Form – A funny thing about poetry as a form is that many students have a very set, preconceived notion of the conventions of poetry. They are prepared to rhyme, focus on rhythm, write in strictly numbered stanzas… almost as if they’ve been taught poetry using a checklist. As a result, I feel compelled to expose them to poems that don’t adhere to such conventions. It seems very important to show them that the conventions are there to be played with. This is a great mentor text for that. The line lengths vary, and lie on the page unjustified. Until they see the MAD fold-in conceit, students are challenged by this. They look for reasons for this poem’s disregard for conventional spacing and left justification. I encourage them to consider why Tysdal made these choices. The MAD reference went over my students’ head, which was nice. It allowed them to explore the impact of the folding without knowledge that there would be any such impact. After the chorus of “Cool!” and figuring out the fold, the reasons for the justification were made clear. Then, as frequently happens when we write poetry, the focus shifted to word choice. This form makes word choice very important. The words that start and end many lines of this poem matter. As well, the words that get “lost” in the fold matter too, as they need to build to the line revealed in the fold, but they need to fit in the hiding place behind the fold. Lines can’t be too long, and where they lie must be staggered on the page. Writing Rough Drafts – The stress upon the layout of this poem actually pushes us to a drafting process. A specific part of my instruction to my writers when we began this was to start in their notebooks. We took a page and folded it. Most of them began with the line(s) that they wanted to be shown upon folding. We folded our notebook pages, and placed the words that made up that line left and right of that fold. Those pages were unfolded, and they filled in poems around that line. The words that began and ended their lines were already chosen. Words could be moved around in this draft based upon whether or not they were best suited for to begin or end a line. Writing this first draft also gave us an idea of what the poem would look like visually. I also like that they would need to consider the space between the words that remain after the folding. Are they words from every line in the poem, or are there gaps. Are these gaps there for a purpose, to create a pause to slow the reader, and make them think? Visual Presentation – The visual aspect of this poem loomed large for my writers. They needed to figure out how to set this poem up. We had a number of minilessons talking about the skills involved in achieving the right look. We talked about justification, and the appropriate tech tools to achieve the impact. I was showing them how to find gridlines and rulers to aid in layout. I like using readily available programs, so this became a tutorial on some features in PowerPoint. To achieve the spacing we wanted, I suggested adding each line as a separate line, allowing for easier shifting of words to the right or left of the guidelines where the fold would create that final line. I love the idea of them having those skills to draw upon as they write other pieces, and need to use the placement of lines and words for impact. Analysis – I gave my students a bit more instruction than, “Hey look at these! See how they work? Write one!” We discussed the form, and impact, and then I connected it to the work we were doing. I encouraged them to find a quote within the material we were looking at in our research, and reaction to, global issues and social justice topics. This quote was to be what the fold would reveal. We had great discussions about how we could do this. The poem could leads to the quote as a final line, building context. What if the poem deconstructed the quote. If the quote were a lie, or questionable statement, then the poem could question, or challenge the quote. This proved popular, and allowed many of my writers an access point to their writing. We also had a great discussion about how this changed the impact of the fold-in, almost as if the truth behind the quote were hidden, and then revealed – such a symbolic gesture. These global issues related projects were semester ending pieces, but as we wrote them, I could see other analytical uses for these poems. Much like The Golden Shovel, they could be used as a means of literary analysis and expression. Instead of the words from the existing source ending each line like The Golden Shovel, they could alternate between beginning and end of lines. This poem encourages a lot of the things I think matter in a writing task. There is an opportunity to play, and be creative. 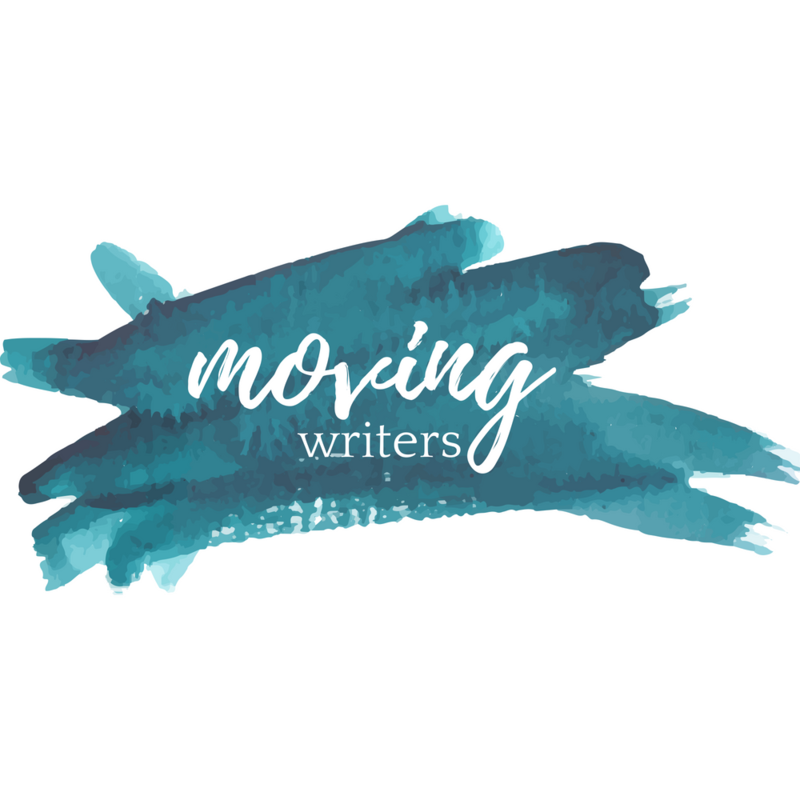 There is a structure that exists, which can be used to support writers who need to have that comfort. It makes word choice matter. It can be simple, and challenging. It can be used as a tool to explore ideas. They are very cool when they’re completed, which makes the writer proud. If that happens, it’s pretty much a win, right? What have you taken to class lately almost immediately after discovering it? Did it work out as well as you’d hoped? Previous PostTeaching From My Twitter Feed: Fun with Maps Next PostWhat Time is It? Notebook Time!